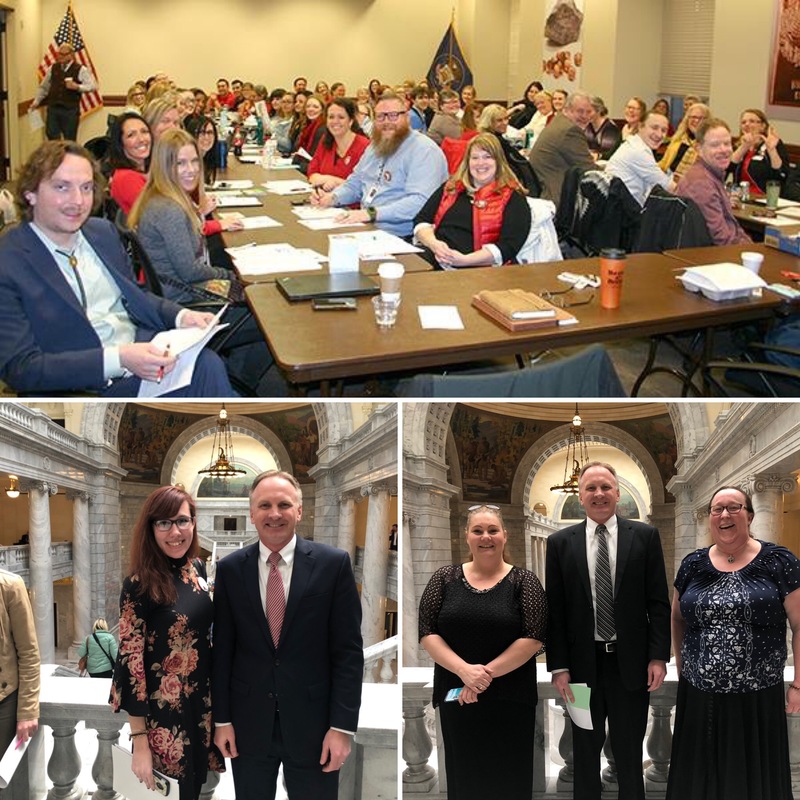 Home > News > 2019 Utah Legislature - Week 4 Summary! Extremely busy week! Thanks to everyone for reaching out over the last few weeks, letting me know how you feel about the issues. Less than three weeks left! What is the Utah Legislature Doing About Air Quality? It is always so great to see parents of students and hard-working teachers up at the Capitol building! Thanks so much for coming and letting your voices be heard! 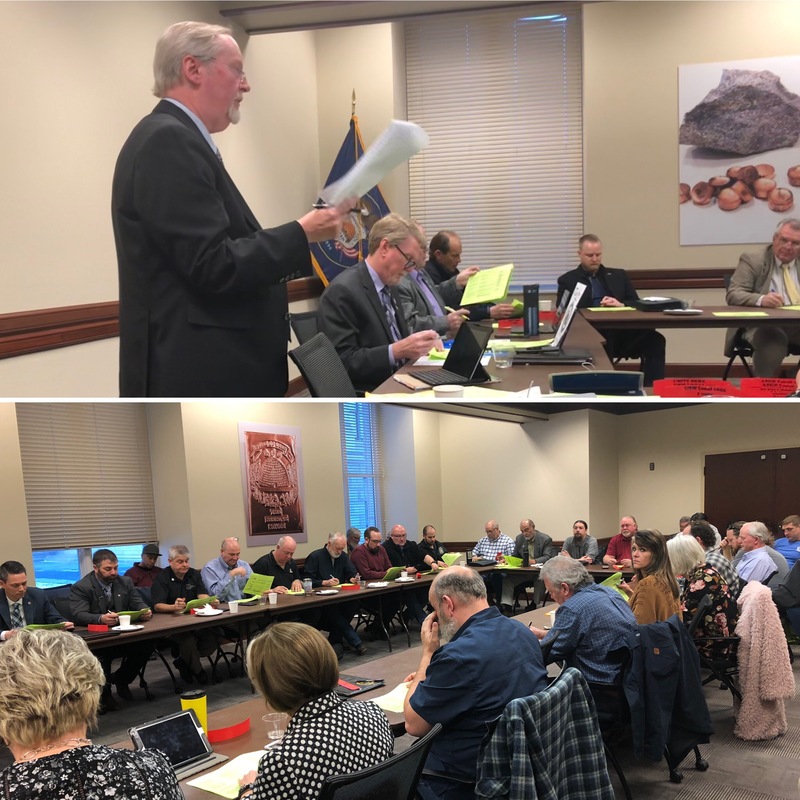 Every Wednesday, I attend the morning legislative meeting with groups that represent working families throughout the State. Thanks so much for your great work! HB129 - Campaign Amendments - PASSED! - I am the chief sponsor of this bill. This bill passed the floor of the House 72-1. Passed the Senate this week 27-0. Came back to the House on Concurrent and passed 66-4. This bill has now passed and is waiting for the Governor's signature. States are divided as to whether campaign funds can be used for childcare while campaigning. Federal law allows it for federal campaigns. 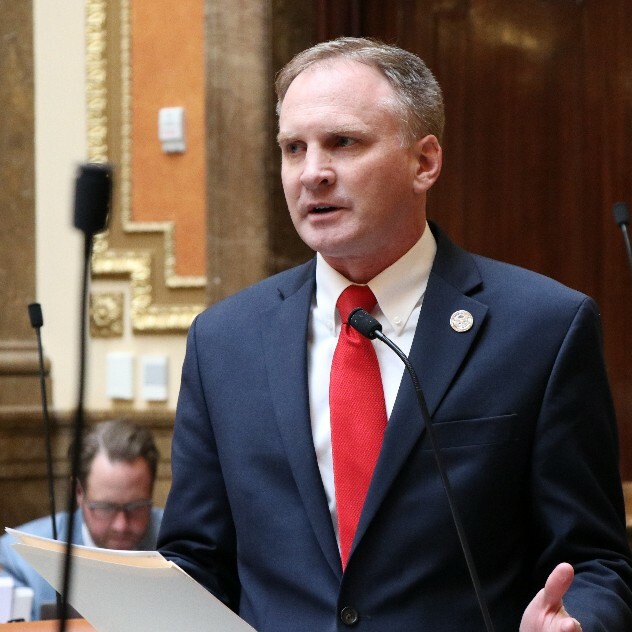 This bill would make clear that in Utah, campaign funds may be used for childcare expenses while campaigning. Rep. Stephanie Pitcher (Democrat) and I are jointly sponsoring this bill. There are so many wonderful people and leaders in this State. And they shouldn't be discouraged from running simply because they have childcare responsibilities. HB57 - Electronic Information or Data Privacy - I am the chief sponsor of this bill. This bill passed the House Judiciary Committee unanimously passed the House floor 71-0. This bill seeks to apply the same 4th amendment protections that we have in the paper and physical world, to the digital world. So much of our communication and information is now in digital and electronic format. And a lot our personal information is stored with third-parties (Dropbox, Google Drive, etc.). This bill simply would require law enforcement to seek a warrant from a judge if they want access to such digital information. See story here. HB52 - Remote Notarization Standards - PASSED! - I am the chief sponsor of this bill. Passed 68-0 on the House floor. Passed 28-0 on the Senate floor. This bill allows notarizations to be performed remotely. Currently, notarizations are only allowed to be performed in-person. Beginning November 2019, you'll be able to perform a notarization through your smart phone. Fantastic bill. Several states have already adopted remote notarizations. HB163 - Offenses Against the Administration of Government - I am the chief sponsor of this bill. Passed unanimously in the House Government Operations Committee. Passed the House 63-10. Awaiting action in the Senate. This bill is in response to an audit performed by the State Adutior's office. One recommendation that came forth after the audit was to clarify Utah law that it is unlawful to use government property for personal use. Here is a story explaining the issue. 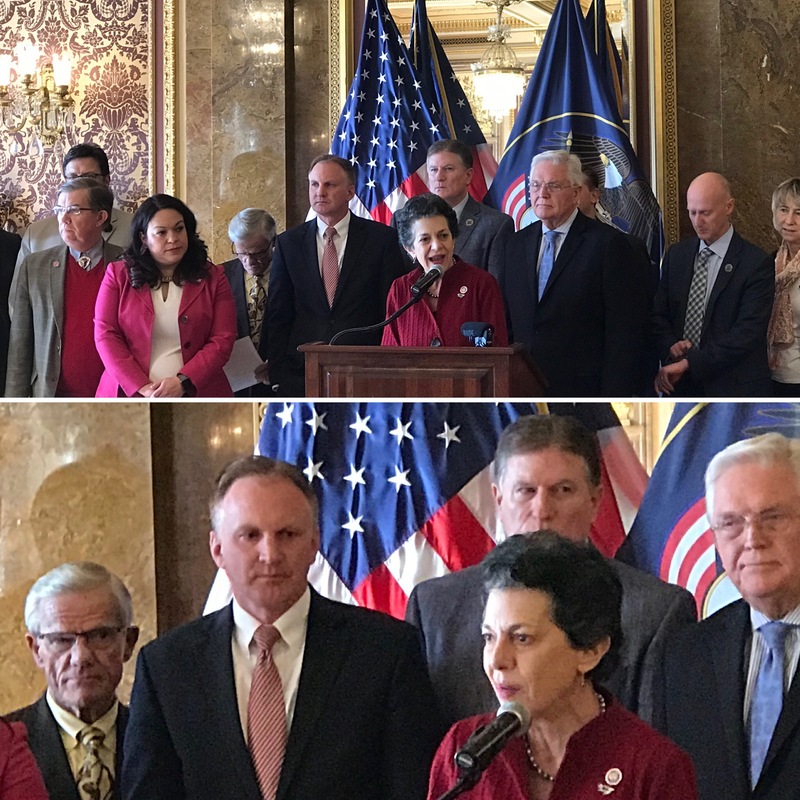 HJR4 - Proposal to Amend Utah Constitution -- Legislator Qualifications - I am the chief sponsor of this bill. Passed the House 73-0. Passed a Senate committee 4-0. Passed the Senate floor 25-1. Awaiting one last vote from the full Senate. This bill is to clarify how old a legislator has to be. The state constitution says that a legislator must be 25 years of age. But it does NOT say by when he/she must be 25. At the time of filing (in March)? At the time of the election (in November)? At the time he/she assumes office (in January)? This bill clarifies that the legislator must be 25 years old "at the time of election" (in November. HB168 - School Bus Safety Amendments - I am the chief sponsor of this bill. Passed the House Transportation Committee 7-4. Awaiting action from the full House. This bill would require seat belts on new school buses starting in 2020. This issue can be summed up by a quote I made during the hearing. "It's silly and interesting that we require by law all children and all adults in our own personal vehicles to wear seatbelts. 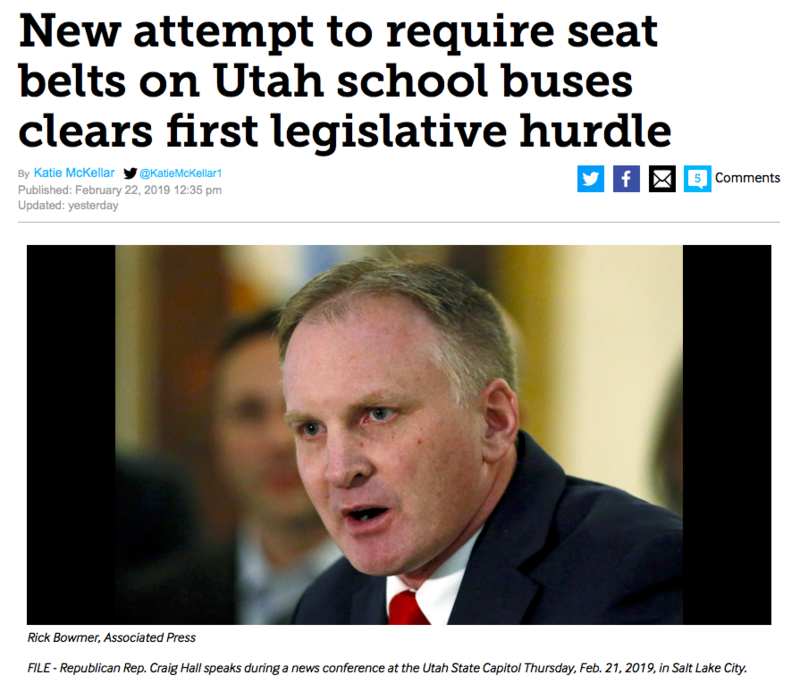 … But for some reason, we find it perfectly acceptable to put kids in buses with no seat belts at all," Hall said. 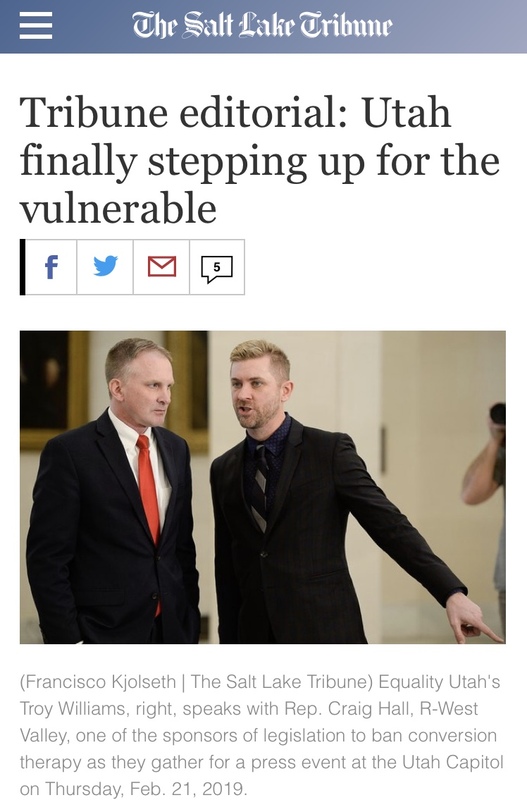 HB399 - Prohibition of the Practice of Conversion Therapy Upon Minors - I am the chief sponsor of this bill. Conversion therapy is a medical practice or treatment meant to change sexual orientation. It has been rejected by major medical groups including the American Medical Association, the American Academy of Pediatrics, and the American Psychological Association, among many others. Study after study has shown that such a practice is ineffective and very harmful. A recent study showed how LGBT youth subjected to conversion therapy were two times more likely to experience depression and nearly three times more likely to attempt suicide. 15 states have already prohibited this practice. Hopefully Utah will be the 16th. I greatly appreciate all who have reached out, thanking me for running this bill. I am cautiously optimistic we will be able to pass this bill this Session. I've held three Town Hall since the session began. Thanks to those who attended!. Great comments and questions. Thank you!!! I have mailed a survey to constituents within District 33. The answers you provide to these survey questions are invaluable. Please, please, please fill it out and return! 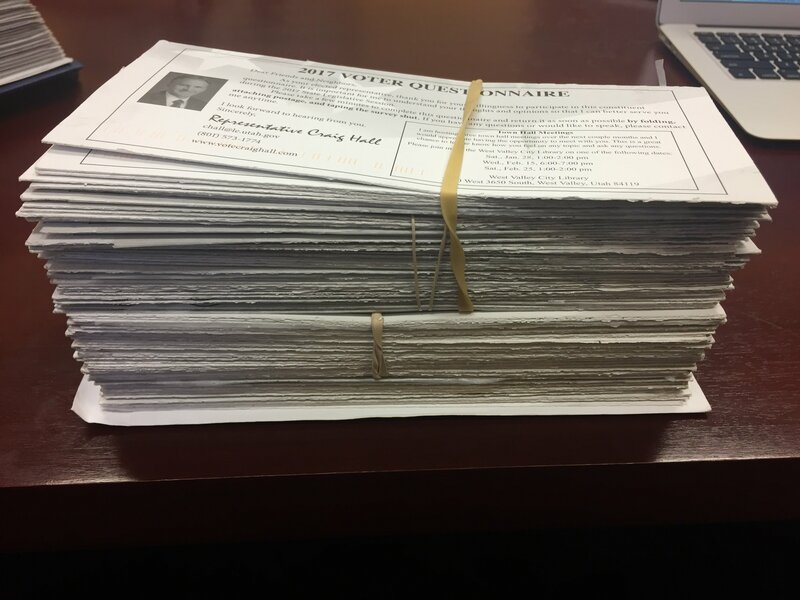 (Below is a photo of some of the paper surveys that have been returned!). I am very interested in your perspectives. Your comments and thoughts are greatly appreciated. You can also take the survey online at https://www.surveymonkey.com/r/RepHall2019 if you prefer that method. Thank you so much! As you may have heard over the last few weeks, much discussion at the Capitol was focused on Medicaid. In November, the voters passed Proposition 3 which expanded the number of Utahns that are eligible for Medicaid. In District 33, Proposition 3 prevailed by almost 30 percentage points. There has been been some effort this session to modify what was passed by the voters. After a lot of study, thought and public input, I ended up voting NO on the bill that will modify Prop 3. Thanks to everyone who reached out to me over the last few weeks regarding their thoughts on the issue. I greatly appreciate it. One of our State's treasures is the State Capitol building. And visiting during the legislative session is the best time of year to visit. Lots of action happening every day. I would love to give your family / school group / church group / etc. a behind-the-scenes tour of the State Capitol. Give me a call/email and we'll make it happen. Thanks for. visiting! Here's a shot from the "snow day" this week.